This HEALING SALVE has been reported to aid in the healing of cuts, sores & scrapes. Many of our customers use our Healing Salve for problem skin types like eczema and psoriasis. * Absorbs easily into skin, without a greasy feel! * Non-comedogenic and will not clog pores! * Moisturizes and Hydrates the skin...leaving skin soft and supple! * Aids in healing of the skin, enhanching skin cell restoration! Other beneficial ingredients include Calendula Infused Oil, Shea Butter, Cocoa Butter, Hemp Butter & fresh Beeswax. We have add Tea Tree and Lavender Essential Oils for their healing qualities! *Comes packaged in a convenient 1oz push up tube! 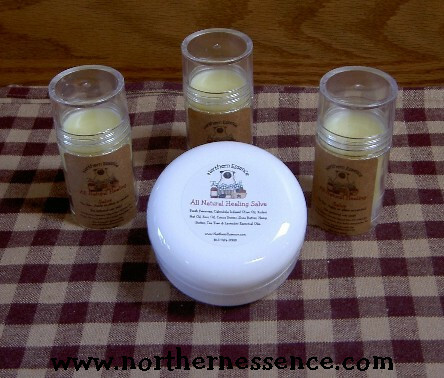 Click the button below to add the Northern Essence Natural Healing Salve to your wish list.